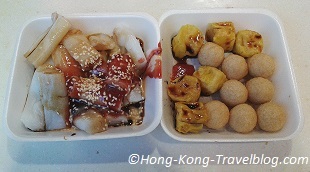 Today I’m going to introduce the mouthwatering Hong Kong street food to you. You know that Hong Kong is a gourmet heaven. 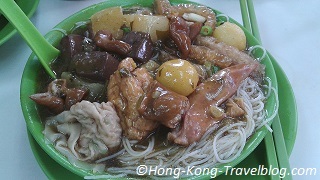 Other than fine dining, street food is also a part of Hong Kong culture. For the first time, Michelin Guide has recently included some best street food in Hong Kong on the list. 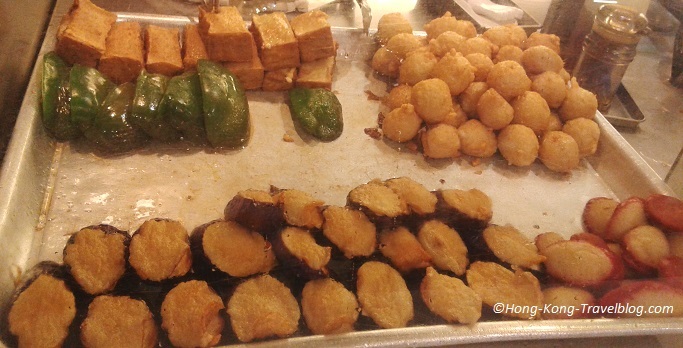 Actually, Hong Kong street food has a long history. At first, they began as roadside stalls or in a form of push carts to cater the needs of the general public. Street food stalls developed vigorously in 1950-60’s selling a wide variety of snacks. Hong Kong street food price was very low and therefore they were so popular. However, the government got rid of them gradually and they almost disappeared on the street in late 1990’s. Some roadside stalls then entered the shop to stay afloat, but many of them were forced to close down. Occasionally, you may still spot one to two carts on the street, especially during holiday seasons or in the midnight. Stuffed three treasures (tofu, peppers, eggplant with fish paste) You know, Hong Kong is a coastal city and people love to have fishes! Have you started feeling hungry? Most of them are served in bamboo sticks, styrofoam boxes or paper bags. They are all ready to eat and there is usually no dining table or other facilities. If you would like to have a more in-depth look into the best street food in Hong Kong, you may have to check the Michelin Guide Hong Kong. The prices of street food in Hong Kong are very reasonable, from around HK$ 10 to 30 (~US$ 1.29 to 3.87), or even less than HK$ 10. Although the prices have been rising, you may still find them very cheap to be honest. Feel free to contact me for the exact locations! 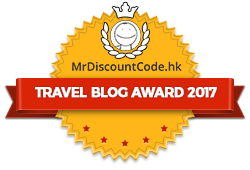 Let us know your favourite Hong Kong street food and Hong Kong street food blog. Share with us your secret Hong Kong street food location. Thank you for reading this post. Please like us on Facebook and share our posts. It’s a shame that the government has cracked down on street food in Hong Kong, it seems like such a cool part of the culture. Good to have a guide for street food though as it’s often hard for a Westerner to tell what something is, or if it is good to eat!